Earlier this month, I flew out to Las Vegas to attend the eagerly awaited Microsoft SharePoint Conference 2012 (#SPC12) to see what the future of SharePoint will offer Ballard Chalmers and our clients. While I was not able to take in all of the sessions, I’ve tried to capture the highlights that will make users ‘super excited’; the tag-line of Microsoft speakers over the 4 days! Microsoft has clearly invested a lot and time and money into improving how SharePoint now looks and the overall UX (user experience). 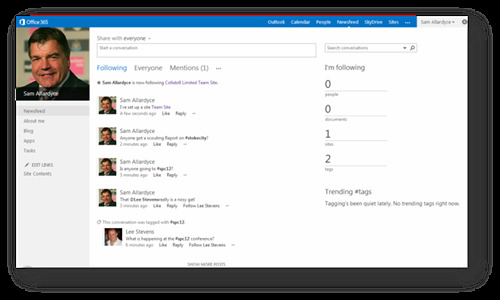 It’s fair to say that the new SharePoint interface is crisp, clean and noticeably uncluttered. It’s easier for the user to navigate and actually ‘do stuff’. For those familiar with SharePoint this means far less Site Actions > Site Settings sequences. You can now also ‘drag and drop’ email attachments straight from Outlook into Document libraries. You can pretty much Share anything (Sites, Documents, etc) now, without needing a PhD in SharePoint permissions. Yammer did feature quite prominently in a lot of the sessions, with ‘the big reveal’ being that the pricing is changing. They also announced that the Office 365 bundle will now include Yammer (though it can still be bought separately). However, what was covered in the sessions was more about what Yammer is and how they do things. It’s fair to say that everyone I spoke to was a little underwhelmed, dare I say confused, about what Yammer is bringing to the SharePoint party. And here’s the reason why. Yes, there are some things that each of them does better and differently. However, I cannot see Microsoft owning two very similar products without killing one of them off at some stage. My bet (Vegas takes its toll!) would be that the SharePoint Communities features would be the one to go or gradually superseded by Yammer. This is based purely on a hunch and: a) the fact that I didn’t see much of it in any of the social sessions I attended and b) Yammer does this a little bit better. SkyDrive will map seamlessly to SharePoint. This is Microsoft’s cloud-based storage product. Think Dropbox and you won’t be far off. This allows external sharing of documents also. As a Microsoft representative pointed out in one of the earlier sessions, Search and Publishing are now a lot more closely linked. From a user perspective, Search is now a lot slicker in SharePoint 2013. Features like a floating ‘preview’ function when you hover over links are really effective. 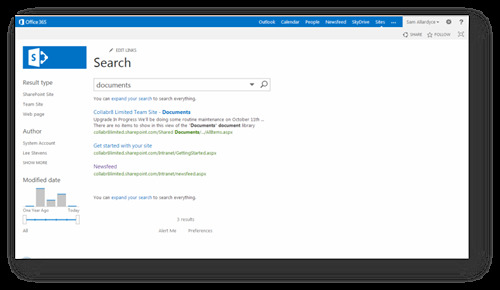 From an administration perspective, it’s now easier to ‘point’ SharePoint search at multiple sources and promote results. This can also be based on social factors, such as the number of mentions and follows etc. I particularly liked the new Content Search Web Part. This allows you to add any ‘related content’ based on Metadata (Tags). So, for example, if you create a news article on one of your brands, you can add content to page automatically which will show links to anything that has been tagged with that brand. Including documents and other news articles. Pretty cool, hey? You can now use managed navigation feature in SharePoint 2013 to create URLs in your SharePoint site, which also means you no longer have to have the word ‘Pages’ or ASPX in the URL of Publishing sites. This is far too big (and complex) a subject to cover in detail — I will provide a top-line summary. Cloud and Cloud based apps are going to be a game-changer for many companies using SharePoint. It’s now theoretically possible for Developers to create “Apps” for SharePoint outside of SharePoint and/or upload these to the new SharePoint App store. Now here’s the clever part. As these apps will be hosted in the cloud, the vast majority of the power and computing to run these apps will also be hosted there. This means that all of the legwork will be done outside of SharePoint, meaning that IT Departments will no longer have to worry about ‘SharePoint servers not coping’. This will result in more vendors selling Apps on the SharePoint market and will ultimately allow companies to reduce development time by purchasing “pre-built” Apps. I would encourage you to read Suzanne George’s Blog Post if you want to know more about this subject — written in very accessible language. Saving the best for last. SharePoint 2013 on a mobile device is going to be a painless, enjoyable experience. There I said it! Another great tool is the new Design Manager in SharePoint 2013. This allows you to preview what your content will look like on various mobile device plus select what content appears on a mobile device through different, HTML5 based, views. I think, companies that have already spent thousands of pounds customising SharePoint to work on mobile, will have a considerable challenge integrating these features. Once again, reiterating my belief that “out of the box” is always the way to go.